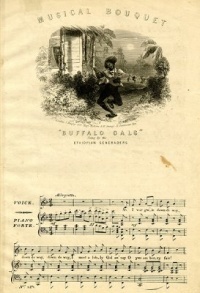 "Buffalo Gals" (c. 1840), covered by Malcolm McLaren on his 1983 album Duck Rock, which mixed up influences from Africa and America, including hip-hop. The album proved to be highly influential in bringing hip-hop to a wider audience in the UK. 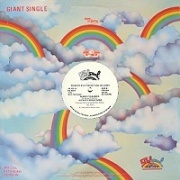 Two of the singles from the album ("Buffalo Gals" and "Double Dutch") became major chart hits on both sides of the Atlantic. The music of the United States reflects the country's multi-ethnic population through a diverse array of styles. Rock and roll, country, rhythm and blues, jazz, and hip hop are among the country's most internationally renowned genres. Since the beginning of the 20th century, popular recorded music from the United States has become increasingly known across the world, to the point where some forms of American popular music are listened to almost everywhere. Much of modern popular music can trace its roots to the emergence in the late 19th century of African American blues and the growth of gospel music in the 1920s. The African American basis for popular music used elements derived from European and indigenous musics, often described as a melting pot. In the 20th century the American music industry developed a series of new forms of music, using elements of blues and other genres of American folk music. These popular styles included country, R&B, jazz and rock. The 1960s and '70s saw a number of important changes in American popular music, including the development of a number of new styles, including heavy metal, punk, soul music, and hip hop. Though these styles were not popular in the sense of mainstream, they were commercially recorded and are thus examples of popular music as opposed to folk or classical music. The New York classical music scene included Charles Griffes, originally from Elmira, New York, who began publishing his most innovative material in 1914. His early collaborations were attempts to use non-Western musical themes. The best-known New York composer was George Gershwin. Gershwin was a songwriter with Tin Pan Alley and the Broadway theatres, and his works were strongly influenced by jazz, or rather the precursors to jazz that were extant during his time. Gershwin's work made American classical music more focused, and attracted an unheard of amount of international attention. Following Gershwin, the first major composer was Aaron Copland from Brooklyn, who used elements of American folk music, though it remained European in technique and form. Later, he turned to the ballet and then serial music. Charles Ives was one of the earliest American classical composers of enduring international significance, producing music in a uniquely American style, though his music was mostly unknown until after his death in 1954. Many of the later 20th-century composers, such as John Cage, John Corigliano and Steve Reich, used modernist and minimalist techniques. Reich discovered a technique known as phasing, in which two musical activities begin simultaneously and are repeated, gradually drifting out of sync, creating a natural sense of development. Reich was also very interested in non-Western music, incorporating African rhythmic techniques in his compositions. Recent composers and performers are strongly influenced by the minimalist works of Philip Glass, a Baltimore native based out of New York, Meredith Monk and others. Unless indicated otherwise, the text in this article is either based on Wikipedia article "Music of the United States" or another language Wikipedia page thereof used under the terms of the GNU Free Documentation License; or on original research by Jahsonic and friends. See Art and Popular Culture's copyright notice. This page was last modified 19:30, 25 March 2019.